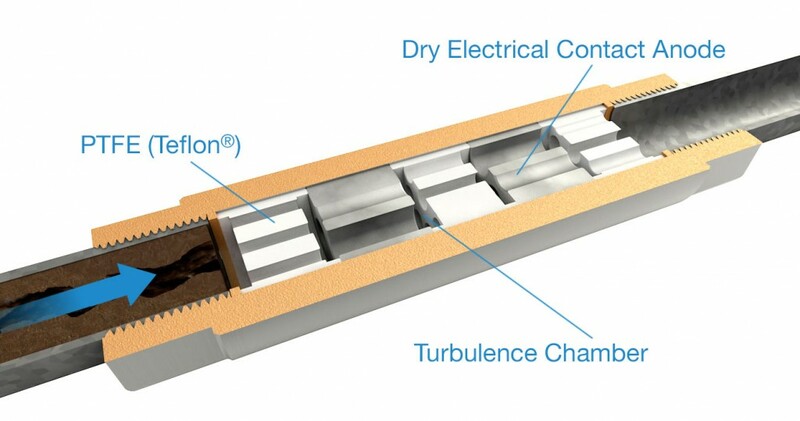 Unlike systems that use harsh chemicals to dissolve scale and corrosion and contribute toxic pollutants to groundwater, the ION ScaleBuster works without chemicals. Instead, it employs an electrostatic process that is planet-friendly. This reduces energy and water consumption, while reducing or, in certain cases, eliminating toxic water discharge. The patented construction of its PTFE (Teflon®) turbulence chambers alters the static balance within the unit. This neutralizes charged particles, causing them to flocculate, or form large clump particles that are slower to re-dissolve in the water. In normal “straight flow” systems, the flocculate particles of scale remain harmlessly in the flow of the water and are unable to adhere to the pipe surfaces. In re-circulating systems – or those that contain settlement areas – filtration or flushing is commonly used to remove these treatment by-products. Corrosion is now under control and further damage to the system and associated equipment is prevented. Sophisticated laser particle analysis was used in the development of the ION ScaleBuster to determine the optimal precipitate size. The large particles produced are much slower to re-dissolve in the water, extending its beneficial treatment effects. Информация литиевый аккумулятор у нас на сайте.